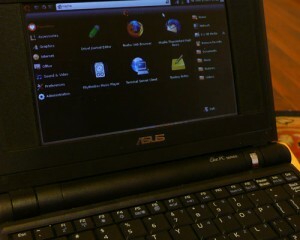 Since installing Ubuntu on the Eee, I had no doubt it was going to replace the Xandros install full-time. It has a lot more features for my inner geek and better support for the applications that only I can find essential. It also takes a hell of a lot longer to boot up. But that’s okay, these new Atom processors don’t take up a lot of battery life when they’re in standby… If I were a real reporter, I’d test that theory. But since I’m blogging, so I’ll throw out any kinds of lies that I like – so long as I’m upfront and honest about it. So far so good, except Resume doesn’t work on Ubuntu Eee, either. So I followed the steps on the usual eee user wiki about suspend/resume. And that didn’t work either. Furthermore, you can replace the pm-suspend command with the same – and your shiny new Ubuntu Eee will wake up when you ask it. Rather than whining about it being too early and throwing the covers over its head. #Make a backup, just in case. And that will let you continue to use the lid or the shut-down screen for all your eee suspension needs. Hopefully I can do something about that initial boot-time, next.